You can DOWNLOAD NOW ! FREE: The Greenpoint Christmas story, "...and To All A Goodnight..."
In 1998 The Welcome To Greenpoint website (www.GreenpointUsa.com) released the TD Marlo book (manuscript) called "Welcome To Greenpoint". It was the first book published about Greenpoint in over 45 years. A ton of them were sold, and given away to WTG contributors. Today, the book is actually in the reference material of the main Greenpoint library and the main Brooklyn Library headquarters. It has been OUT OF PRINT for years, and has even been seen on ebay selling for $100 ! FOR A LIMITED TIME GreenPointMusic.com has secured the rights to RELEASE THE COMPLETE TD MARLO MANUSCRIPT IN ELECTRONIC FORM ! It's a MUST HAVE for all Greenpointers! The book has captured moments in time in our beloved neighborhood that will surely be part of Greenpoint history (actually it already is because it's in the library!). It's also bound to stir up happy memories of your happy days in good 'ole Greenpoint. Between 2001 and 2003, TD Marlo, local Greenpointer, and author of the popular manuscript "Welcome To Greenpoint", was prompted to create a series of computer art prints to be used to raise funds and bring attention to various local issues and causes. During a time when digital photography, and scanning was in its infancy, Marlo combed the Greenpoint community in search of the landmark images and visual icons that made up the heart of his beloved neighborhood. Amongst the many images that he had documented were St. Anthony's Church and Georges Variety store (now closed) on Manhattan Avenue, St. Cecilia's church on North Henry Street, the Greenpoint Terminal Warehouse on West Street, and The Brooklyn Union gas tank towers (now demolished) on Vandervoort Avenue, The Winthrop Park Angel statue, and even the Calyer Street hot-dog wagon. TD Marlo took those images and digitally enhanced them using early computer techniques such as layering, softening, digital water coloring, etc. The final images were stunning, and unique. 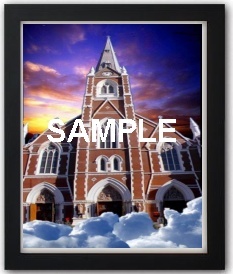 The "Greenpoint's St Anthony" image included the church's magnificent structure seemingly floating in the clouds of heaven against a moody yellow, blue, and pink sky. 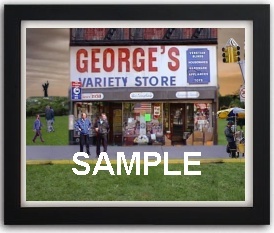 The "Georges" print was a compilation of images that showed the famous variety store (established in 1938, and now closed) nestled in computer layered blades of McCarren Park grass, being travelled upon by the digitally placed locals. In the distance is an image of the Winthrop Park Angel statue. In the foreground, the Calyer Street Hot-Dog man leaning back reading a newspaper. All centered around an American flag in the window, and enhanced with a digitally generated water color painting technique. 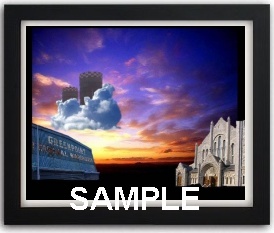 The "Changes" image is another computer layered, and digitally water colored combination of images showing the landmark Greenpoint Terminal Warehouse, and St Cecilia's Church with the now demolished Brooklyn Union Gas tank towers hovering above in the clouds, against the beautifully layered west sky. This package includes 3, print ready, color, 8.5" X 11" PDF files. Each image is centered on a white background, with matte lines, the print title, creation date, and the artist name (TD Marlo). 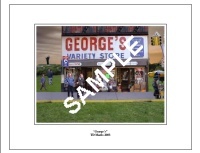 The prints can be trimmed to be suitable for 8X10 or 5X7 framing. Shown as actual 8.5" X 11"